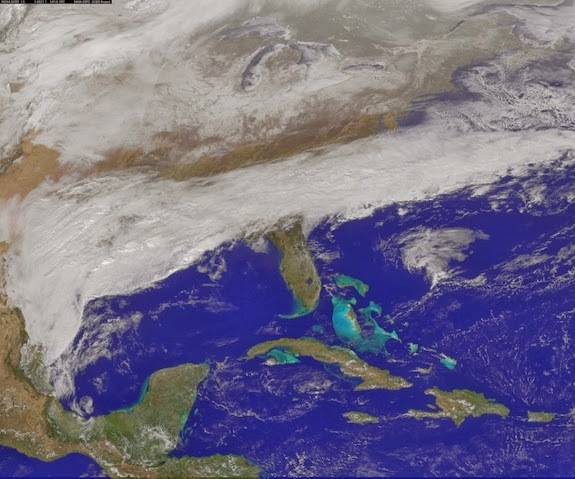 Yes, I know this has been a long time coming, I am sure my partner Janice is wondering if I dropped off planet Earth. I am still around and still beading, but oh so little... My time has been spent with taxes, and I did get them done on time; and dealing with shortages of personnel in the work place, very tiresome and very stressful. I am pleased to announce that life is slowly getting back to normal. 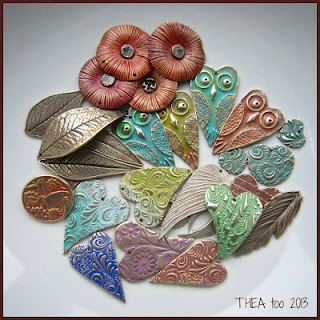 And then I realised that the 8th Bead Soup Party blog hop is only a week away! Let me now introduce you to my bead soup partner Janice. Janice hails from Canada and seems to be a wiz with Copper! 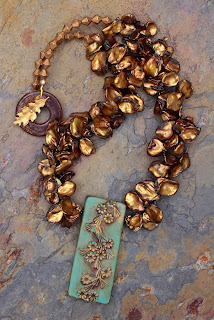 Check out some very creative clasp she has formed with lamp work beads and Copper, she includes a tutorial as well. I particularly like the one that incorporates a skull. Janice sent me Bead Soup ingredients from bead paradise, no this is not the name of the shop, just a place where great beads come from. 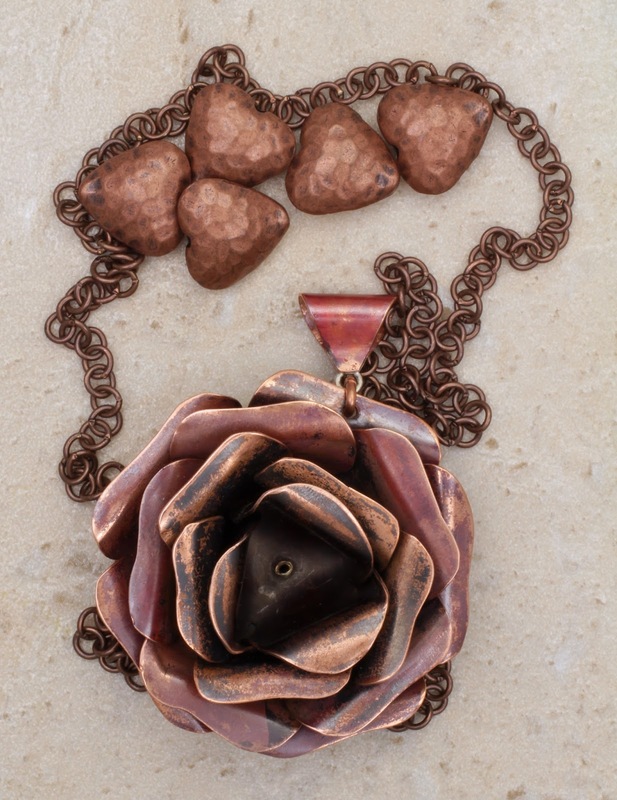 A copper rose made by her, just gorgeous! 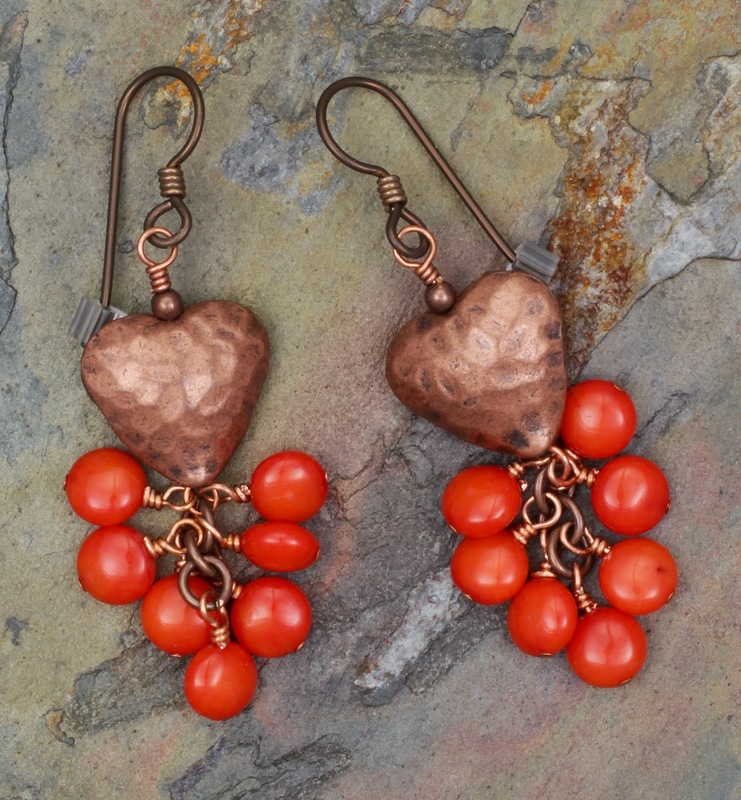 Some hammered copper hearts, what's not to love? and a length of copper chain. 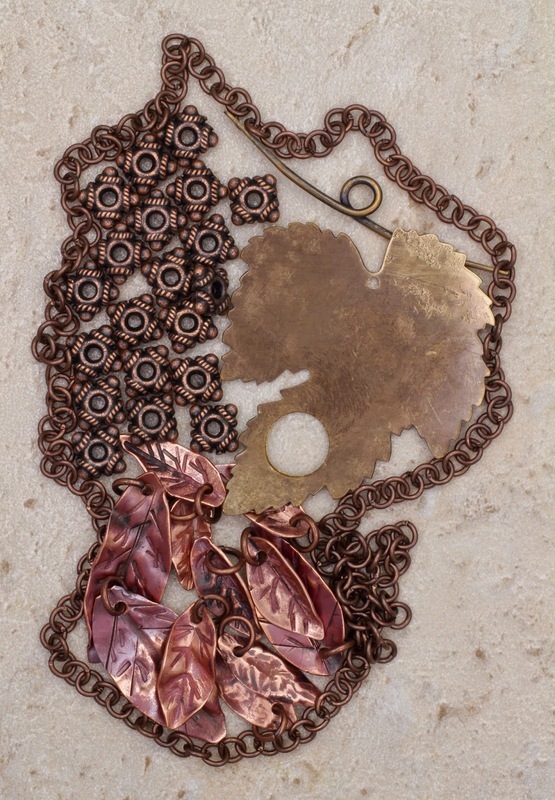 An equally gorgeous brass clasp in the shape of a leaf, plenty of ornate copper spacer beads and a bunch of copper leaves, again made by Janice. 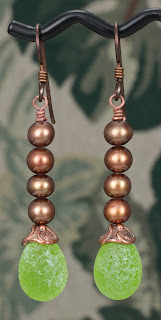 She does some wonderful work with copper. 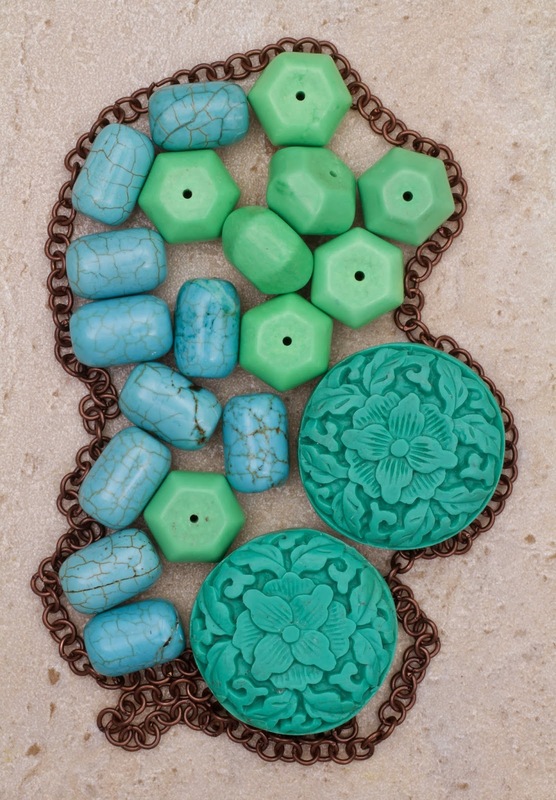 And that is not all, some great blue and green turquoise beads, including two beautifully carved pill box beads. Now the pressure is not to do these great soup beads justice. 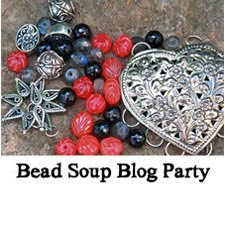 See you next week at the 8th Bead Soup Blog Party blog hop.! 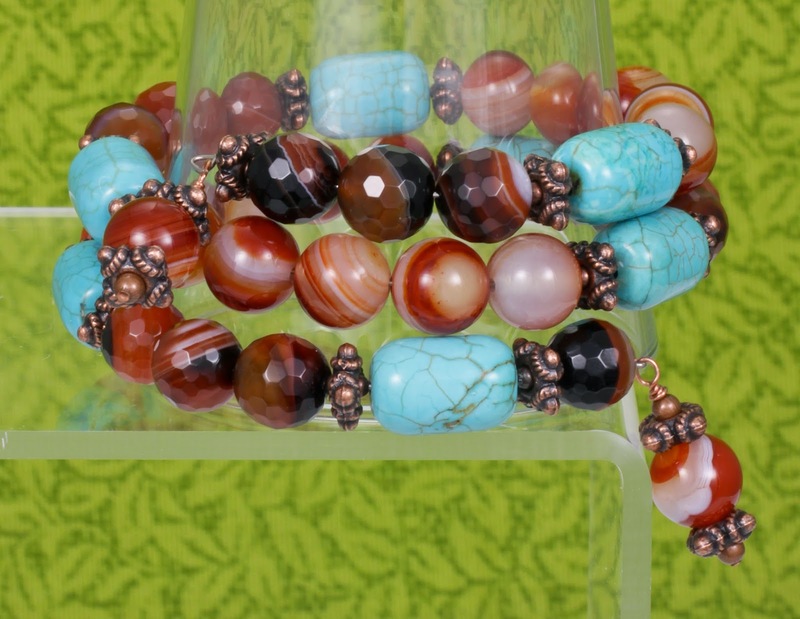 Memory wire stacked bracelets, so easy and so pretty. I love making these. Check out some of the few that I made currently on sale at my shop. I love how this one turned out... and it was sold within hours of my listing it, and that does wonders for the creative soul! 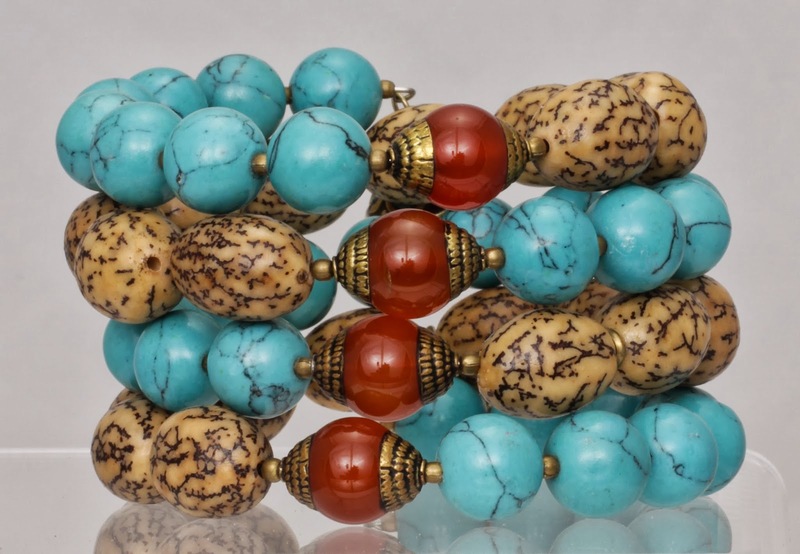 This bracelet was made with Turquoise rounds, natural seed Salwag beads and Tibetan brass capped Carnelian beads. 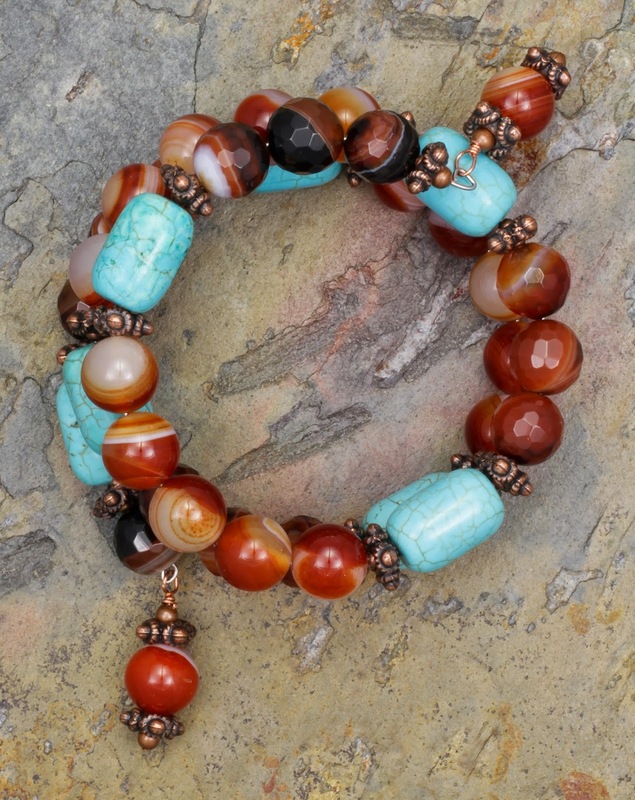 Bead Soup Sign Up and $100 Bead Shopping Giveaway! 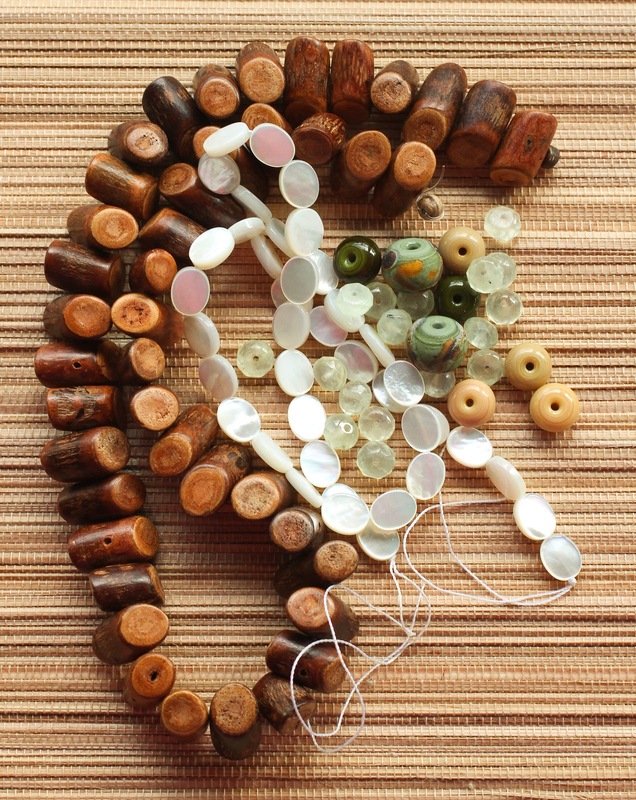 Did you sign up for the 8th annual Bead Soup Party? You have to sign up today, and only today. See you at the Party! How about a $100 bead shopping spree? 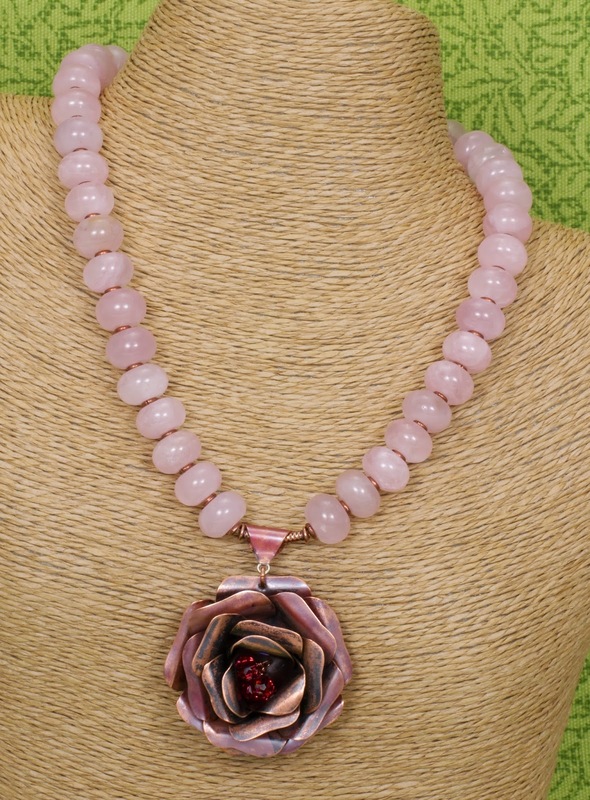 Hop on over to the Beading Gem's blog to sign up for a wonderful opportunity to sign up for a chance to win a $100 to shop at The Bead Shop. This is a great store, I have shopped there and they have a wide variety of beads, stringing material and a nice selection of tribal and ethnic beads and findings. Good luck! that I have been away from my blog. I have been hopping around and reading and watching my fellow artisan bloggers as they made progress these past months. And I am in need of a serious jolt to kick start me to return to my blogging. I never stopped making jewelry, just spent much less time at the computer, other than to buy beads and to list my jewelry in my shop. I must say that I have spent a lot of time on Pinterest too and I am enjoying the inspiration I draw from the pins. 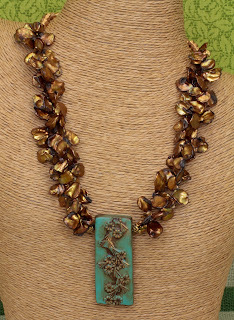 This weekend, I plan to wake from my slumber and hope to sign on to Lori Anderson's 8th Annual Bead Soup Party! Thank you, Lori for undertaking this massive project again this year. I have taken part in 6 of the past 7 and thoroughly enjoyed my experience. I hope to make this my 7th Bead Soup Party. So set your reminders and see you at the Bead Soup Party sign up! 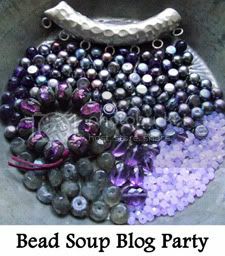 It is ironic that my last blog post was my 7th Bead Soup party reveal on April 27, 2013... geez it has been long! 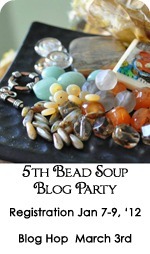 7th Bead Soup Blog Party! Welcome to the Bead Soup Party! 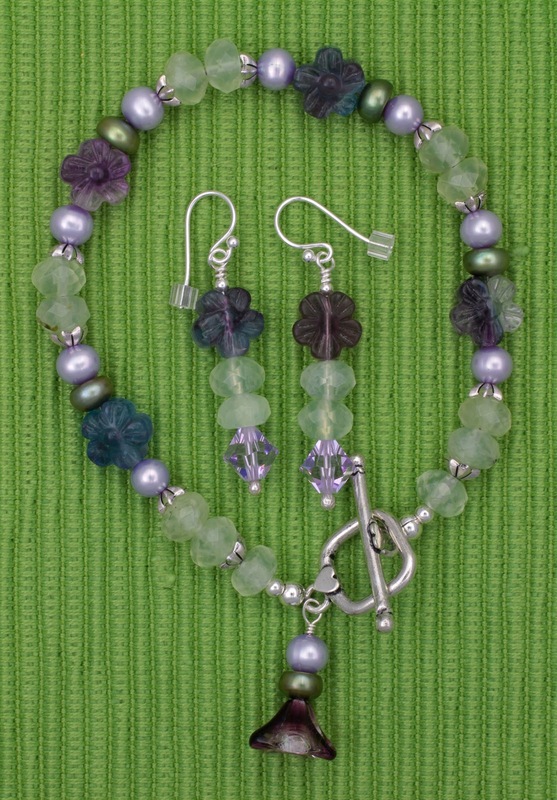 I just could not wait to show off what I have made with glorious beads that my Bead Soup partner Laura, the Bead Therapist sent me, what a gorgeous and at the same time challenging collection it was. March and April were very busy months, a bout of the flu, Spring Break visitors from the North, and tax preparation time, so I was grateful for all the additional time given for this final reveal. The gorgeous turquoise and gold pendant made by Roberta Warshaw and the golden leaf toggle clasp made by Pajego Art House were combined with two strands of golden Keishi pearls to create this necklace. I love how it turned out, do you? 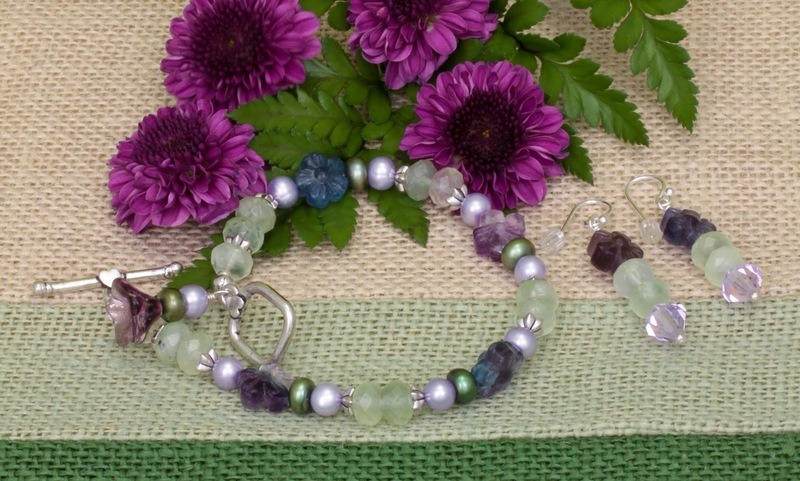 The rondelles of light green rutillated Quartz were made into a Spring flower bracelet by combining them with Fluorite carved flowers, green and lilac dyed freshwater pearls and I used the square love toggle I received from Laura. Wouldn't this be perfect for Mother's Day? 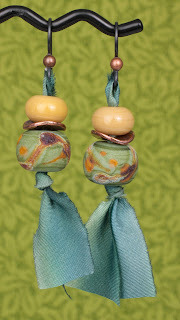 The lampwork beads Laura sent me along with some green silk and a pair of gorgeous light-weight earrings... what do you think? And the best part is that I still have some beads that I can play with, so my party is not quite yet over. 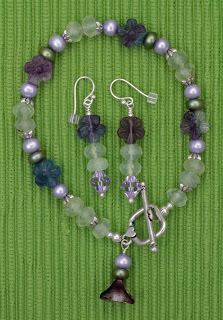 Please hop on over tp Laura's blog to see what she made with the beads I sent her to play with. Don't forget to check out all the more than 200 beaders who will be revealing their beading today as part of the 7th Bead Soup Party. To see a complete list of all the participants, please hop over the Lori Anderson's Bead Soup Party blog. 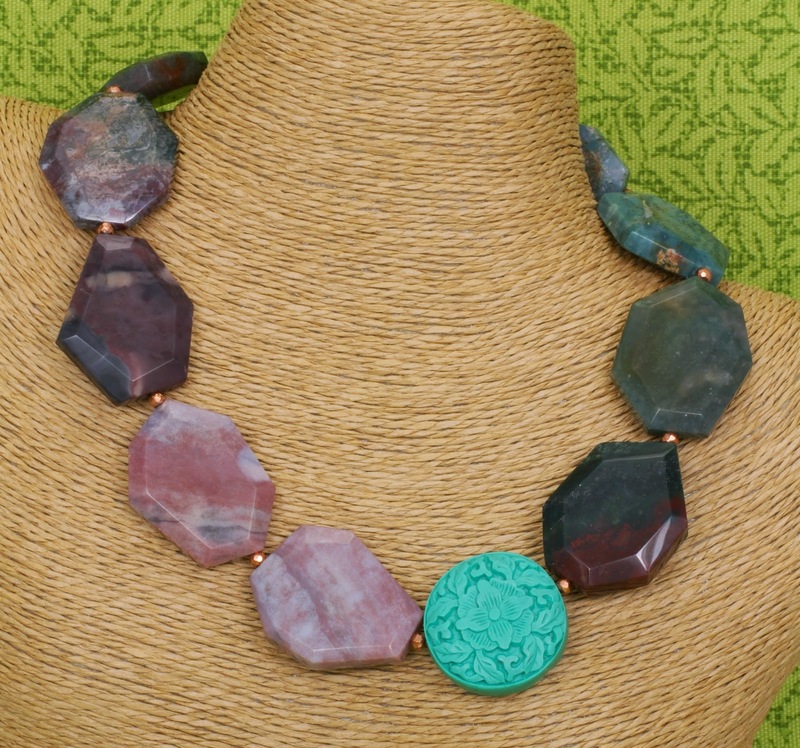 You can see all of the jewelry made by the some 500+ particiapnts of the 7th Bead Soup Party over here at Pinterest. Thank you Lori for hosting this wonderful gathering of beaders, your hard work and dedication is much appreciated by us all! Vintage Paris paper beads, each one individually coated with ultra thick embossing enamel and tipped in gold embossing powder. I used natural greek leather to hang them from and dangle two very lighweight Metallite gold-colored bicones from the two ends. The second pair is made with her Ocean Wave paper beads, paired with some light blue Swarovski pearls and sterling silver findings. The beads are in shades of Turquoise, with silver and gold microbeads, coated with embossing enamel and tipped in silver powder. 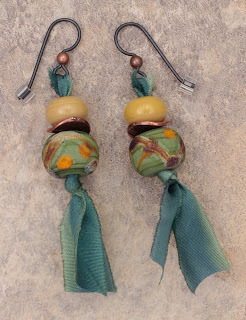 Stop and check the wonderful selection of Paper beads made by Gillian, they make great earrings, they are so lightweight, unique and beautiful! 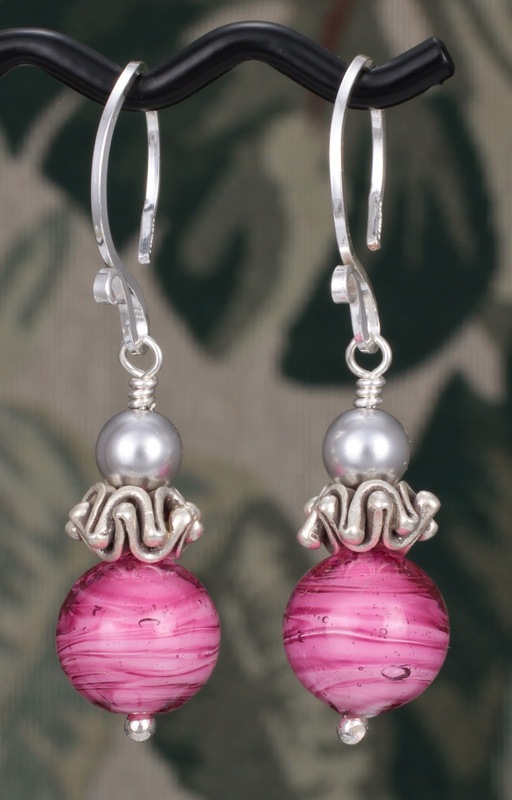 Please stop by and check out all the other earrings made with very creative AJEs on Pinterest. And do not forget to stop by tomorrow to check my Bead Soup reveal. These are the two pairs I posted for weeks 11 and 12. 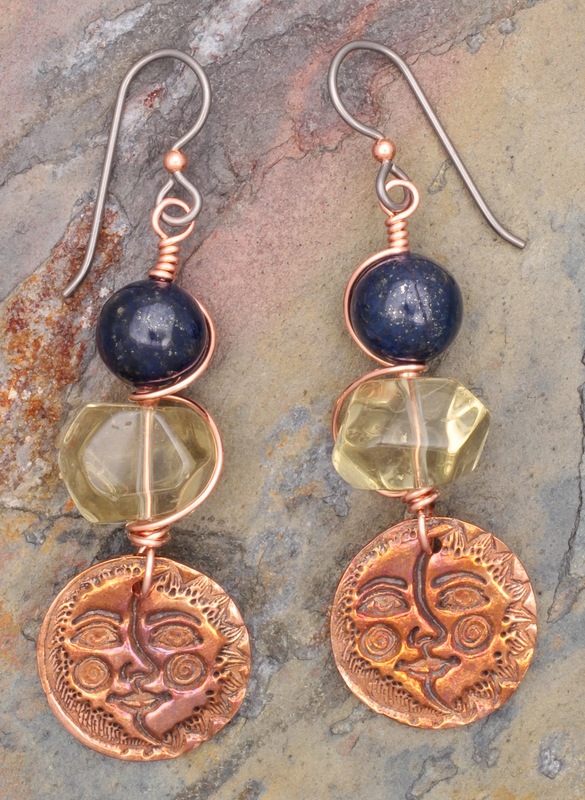 Lovely Sun Moon Copper charms made by Kristi of Kristi Bowman Designs, are the focus of my first pair, along with sunny nuggets of Lemon Quartz and midnight blue rounds of Lapis Lazuli. All wired up with copper wire and dangling from hypoallergenic Niobium ear wires. 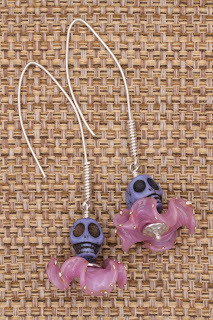 My next pair was made some time ago as part of a Bead Soup Party challenge, but this was a good time to show it off again. 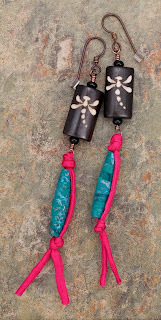 A pair of wooden dragonfly batik beads with a pair of black Onyx rondelles on either end and dangling from it a turquoise Kristal Wick batik ribbon bead wrapped in hot pink silk. I love it, what about you? 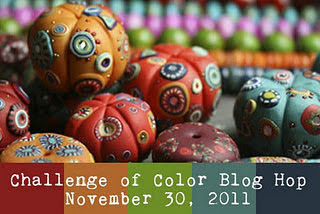 It is week 9 and 10 of the AJE Earrings challange and I am behind schedule in blogging my post for the blog hop. It has been a crazy month, sick with the flu, end of the quarter so busy at work, clean house get ready for company here for spring break, bead soup to cook... but inspite of it all the AJE earrings challenge has been a delight. 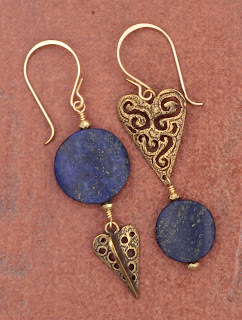 I love that we reveal every two weeks, and it earrings, not too complicated, so many beautiful beads and art jewelry elements what's not to love. It's good for the body and soul... making earrings! These are the two pairs I posted this fortnight. 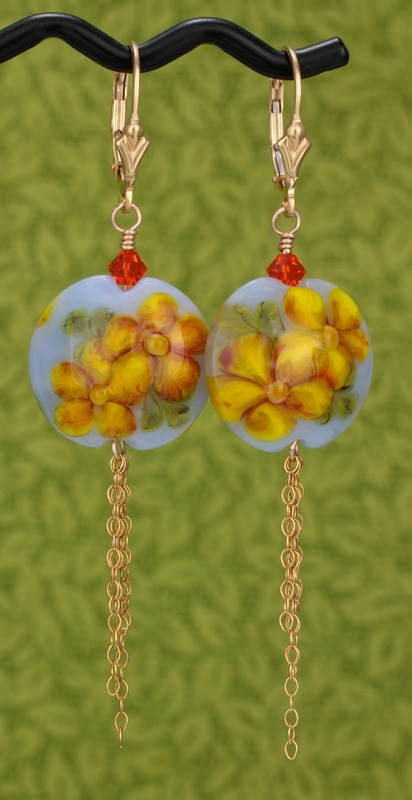 I used a pair of lampwork lentils beads hand made by Joyce of Joycelo with an opal periwinkle background, green leaves and variegated yellow flowers on both sides. The beads are so beautiful, that they did not need much more in the way of adornment, just 14K gold fill levelbacks, some chain, and a Hyacinth Swarovski crystal. The second pair was made using a pair of enamelled butterflies from Gardanne Beads. 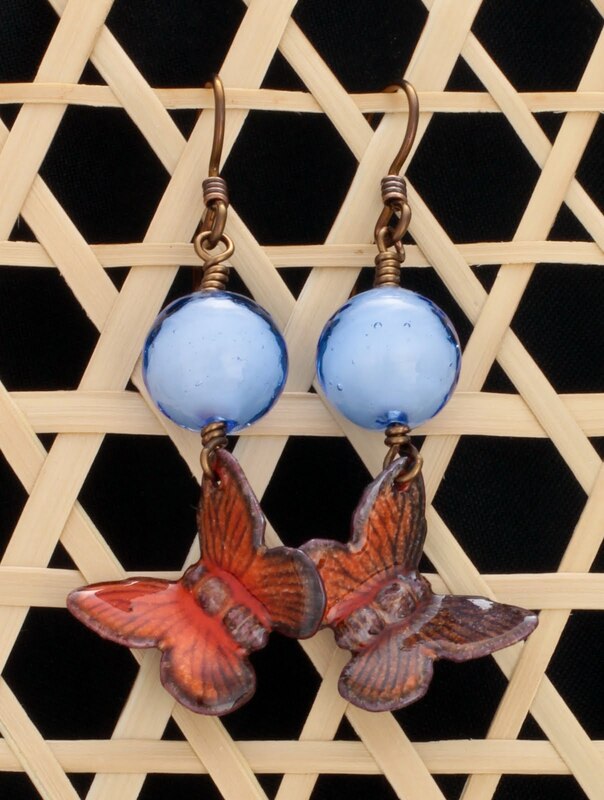 The orange butterflies are paired with white center Sapphire Venetian glass beads, its almost as if the butterflies are flying against a light blue spring sky! Some weeks ago, I received my bead soup ingredients from my partner Laura De Moya. Laura is a Bead Therapist! And not in name only, she actually is Dr. Laura De Moya, a doctor in internal medicine, practicing in Texas. She is also the mother of two daughters and I wonder when she finds the time to bead. She certainly enjoys beading and loves to be challenged as you can see from the very creative designs she has produced for various challenges. Look what she sent me... very gorgeous, very generous and very challenging! 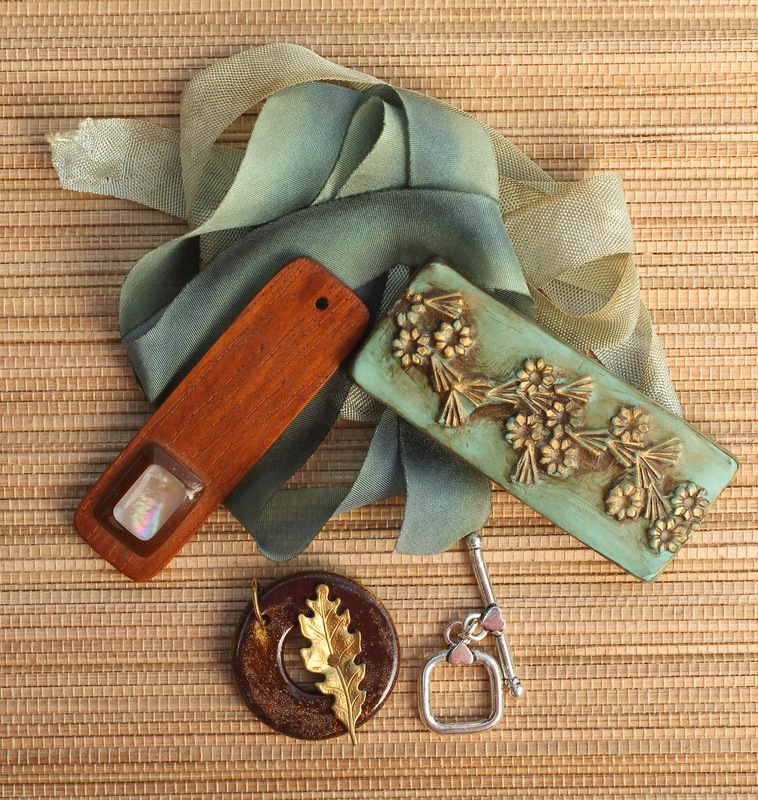 Silk ribbons in shades of cream and green. 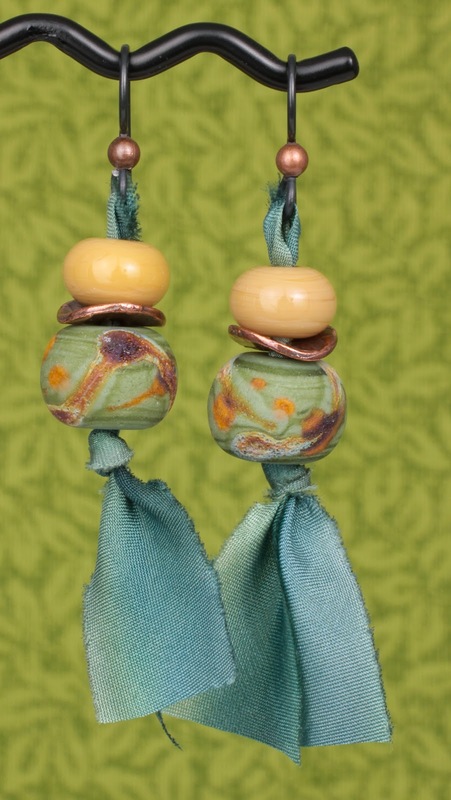 Two pendants, one wooden with a mother of pearl embellishment, and the other a beautiful turquoise green and gold polymer clay pendant made by the very gifted Roberta Warshaw. 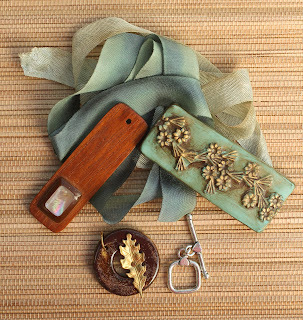 Two toggles, one sterling silver and the other wooden with gold leaf from Pajego Art House. 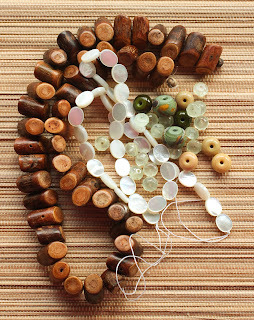 Two strands of beads, wooden cylinders and mother of pearls ovals. Green and cream lampwork beads from Indian Creek Art Glass. Rondelles of green rutillated quartz. I am sorry I did not take pictures of what i sent her, but you can see it when we both reveal our bead soup creations on March 30. This will be a challenge as it is tax time and bead soup time all at the same time! Till then... happy beading! I used Magnesite skull beads from Happy Mango Beads and made the earwires myself. 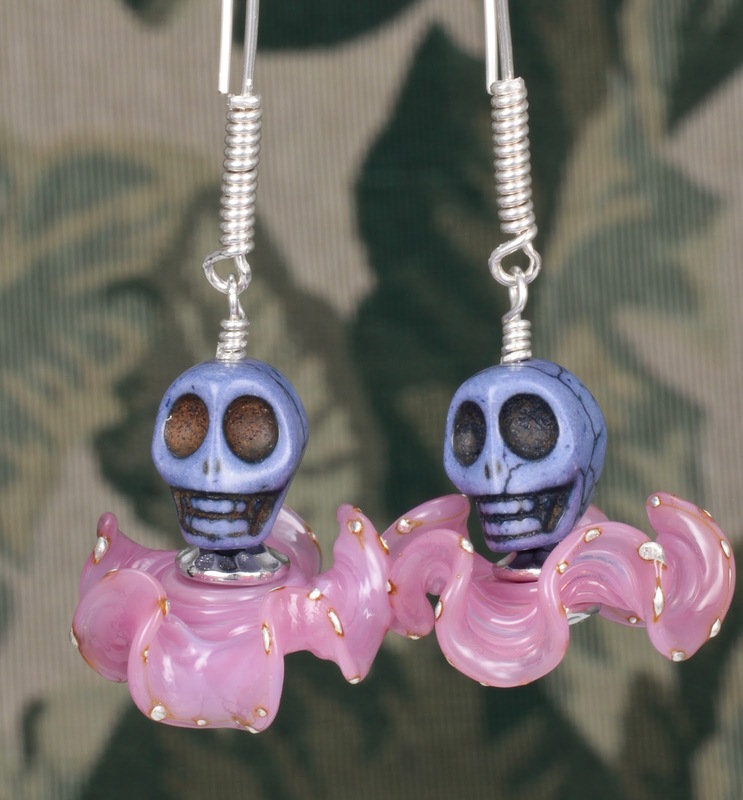 Would you wear this pair of earrings? My next pair uses Fossilized seaside glass head pins from HavanaBeads made by Raida Disbrow. These are lovely, you got to see them to appreciate their beauty. I have used bronze colored freshwater pearls that make the lime green head pins just pop! 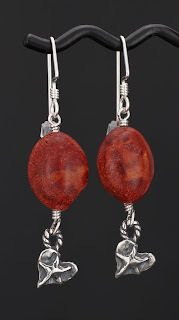 I have been saving a pair of fine silver PMC ruffles that I received from Sandra of PetaloAzul, who was my Bead Soup Partner for the 6th Bead Soup Party. With a pair of hot pink Venetian Glass beads and light grey Swarovksi pearls, I made my third pair of earrings. I love the color combination, do you? 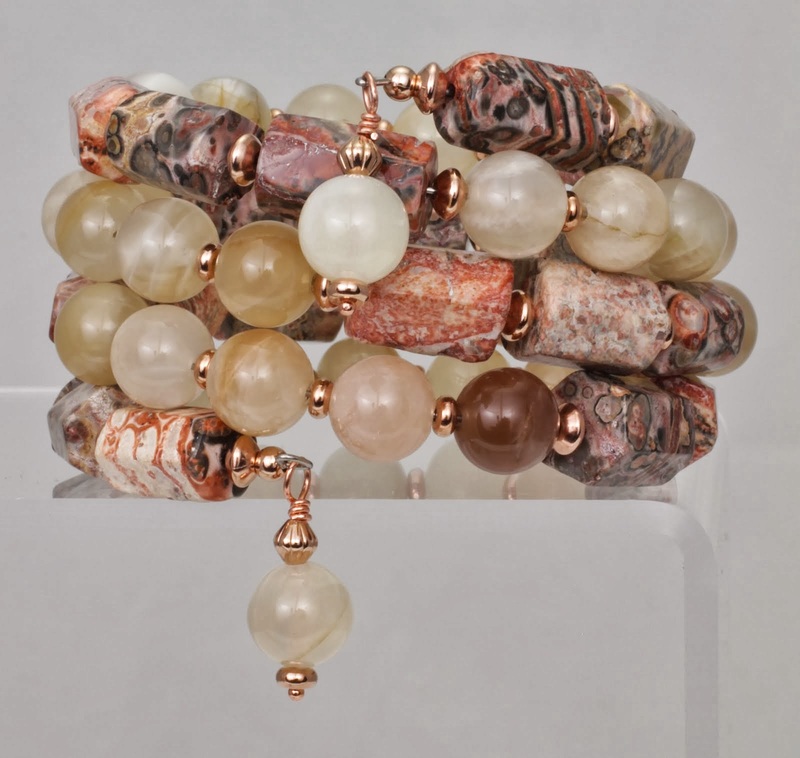 Last Saturday I spent six hours at the ArtCenter Manatee in Manatee County Florida with 9 other jewelry makers taking a workshop wire coiling and making a Crazy Coil Bracelet. This was the first time I made my own toggle and bar, and that was an added bonus. I love it. What about you? 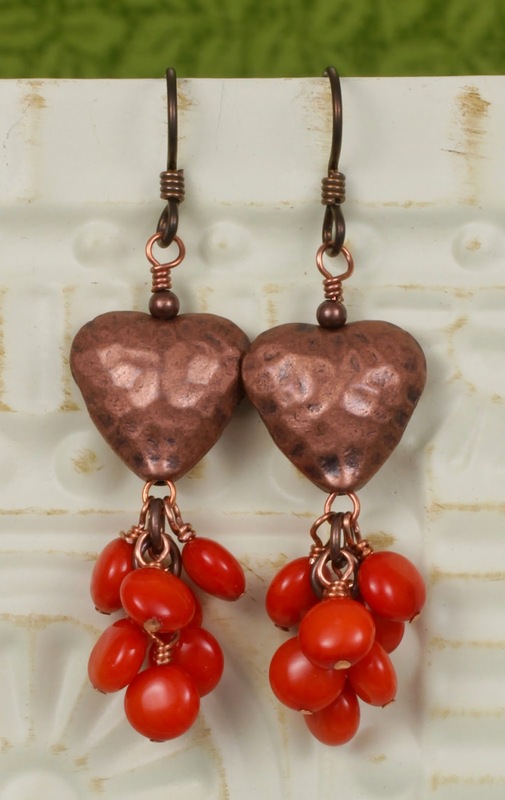 Stacy has some great tutorials on her website, including supplies, and tons of information on metal and wire jewelry making. She also has an Etsy shop with a nice sample of goodies. Today I attended another workshop on forging metal, but more about that in another post. Gorgeous Giveaway from Thea too! Happy Anniversary Lesley, wishing you many more successful years delighting us beaders! Hop on over and enter to win! Week 3 of the AJE Earrings Challange being the week of Valentine's Day, my theme was hearts and earrings featuring handmade hearts by two very talented artisans. 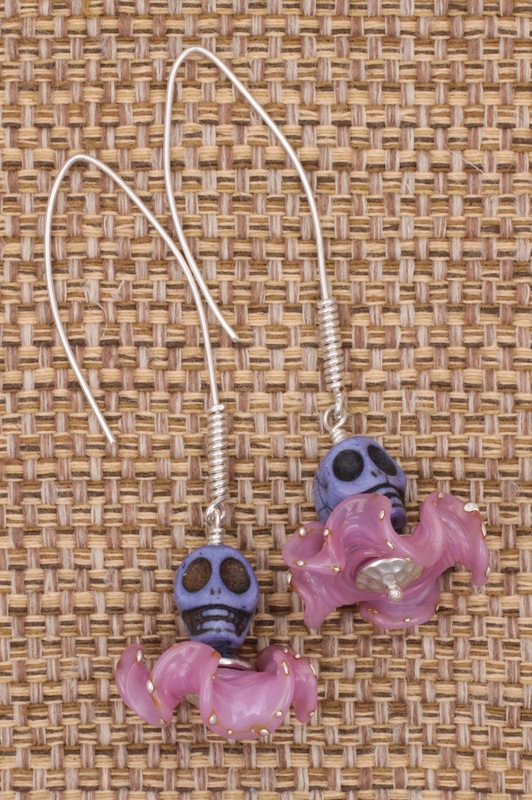 Make sure you stop by and check out all the other earrings made with very creative AJEs on Pinterest.